I had planned to go to Candlemas and the blessing of the candles at my parish's daily mass at 8 a.m. But my daughter wanted to run in the early morning with her running friends so I couldn't go. I thought I'd go to the noon mass downtown instead. I was getting ready for that when I got an unexpected text from my goddaughter letting me know that my next door neighbor had passed away! We had noticed a lot of activity next door last week. Cars were coming and going all the time and at all hours. I didn't know what to think of it. But it never occurred to me that someone had died! My neighbor and I had a friendly relationship. We chit chatted in the summertime outside when we were doing yard work. I think the last time I saw him was in the fall when he was doing the final grass cutting for the season. He had told my husband how grateful he was that we took our big Maple Trees down and planted an evergreen. That made a lot less work for all of us when it came to raking leaves! I quickly tried to see if the obituary was online and found that the funeral was in 15 minutes! I grabbed my purse and told my daughter that I had to go. When I went outside, the funeral procession was already forming in front of my house. I just got in my car and waited and then joined the very end of the line. I'm glad I went. The funeral was lovely and it was so heartwarming to hear stories of my neighbor and see how much he was loved by all. I'm also glad the I got to speak with a few of his children. They told me how much it meant to them to have me come. I felt that I was representing my family and also the neighborhood. 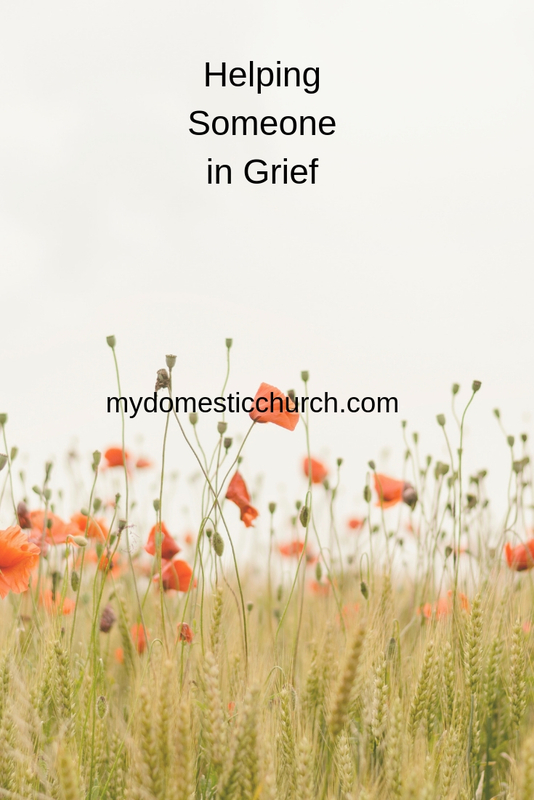 Over the years, I have had a lot of experience with handling grief. 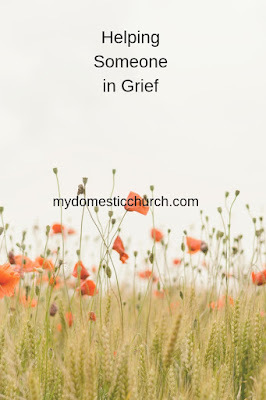 I've been on the grieving end and I have some opinions on what helps the bereaved and what doesn't. So with the loss of my neighbor so fresh, I like to some of those today. Everybody brings food and it's a good thing. The bereaved are too tired and too stunned to worry about preparing meals too. Food is good the week of the funeral but also in the weeks after. And if you can't bring a meal by, a gift card to a restaurant or deli, or grocery store is also always appreciated. Don't be afraid to talk to the grieving. The worst thing you can do is avoid them! Even if you do not know what to say, just a simple "I'm so sorry" with a hug or a pat on the arm means so much. Don't think you have to offer advice. There's nothing you can offer that is going to make anyone feel better. Do more listening than talking. On the other hand, people love to hear funny, joyful, inspirational stories about their deceased loved ones! When my uncle died, I was so pleased to hear from so many people who thought he was very kind and special. Those kinds of anecdotes were helpful to me. At my neighbor's funeral, several of the grandchildren had great stories about how strict their Paw Paw was, and how even in his discipline they knew he loved them greatly. Do something in honor of the deceased. When Princess Diana died, Prince Charles wore a blue suit to her funeral, because she liked him best in blue. Those kinds of heartfelt tributes are much appreciated. Whether it is clothing or a tradition shared with the deceased. Those types of things done in their honor is very meaningful. They need to talk. All you have to do is listen. Don't put a timetable on grief. I think the kind of grief where you think about someone every single solitary day lasts at least a year. And then after that, there are triggers like birthdays and anniversaries. But there will always be a loss there. Don't expect the void to ever close completely. Remember the grieving after the funeral. The WORST part of the whole grieving/ funeral thing starts the day AFTER the funeral. Then the world goes back to normal for everyone else, but not for the family of the deceased! They have to find a new normal and it is very hard. Thinking of You cards, notes, flowers, phone calls, e-mails are very appreciated, even if the bereaved isn't quite ready to fully answer them yet. Just the gesture is helpful. An original post on this topic was posted February 4, 2009.